HAPPY NEW YEAR EVERYONE, LET’S ALL HOPE FOR A GREAT 2018!!! Please keep the Gillitzer family in our hearts and prayers. If your pipes are already frozen, turn off the main water line to the home immediately. Shut off any external water sources, such as garden hose hookups, HouseLogic recommends. This also helps after the ice inside your pipes thaws because you don’t want the water to flood your system. 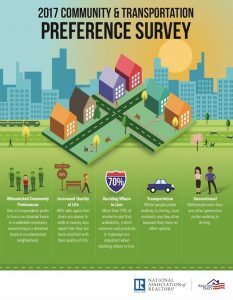 Living in areas that are close to shops and restaurants is becoming increasingly attractive for both young and older generations, according to the 2017 National Community and Transportation Preference Survey conducted by American Strategies and Meyers Research on behalf of the National Association of REALTORS®. Researchers polled 3,000 adults from across the United States to find out what they are looking for in a community. Fifty-three percent of Americans say they prefer to live in a community with homes that have smaller yards but are within easy walking distance of the community’s amenities (rather than homes with large yards where residents have to drive to amenities) according to the survey. Certain generations show even more fondness for living near amenities. Sixty-two percent of millennials and 55 percent of the silent generation (those born before 1944) say they prefer walkable communities and short commutes, even if it means living in an apartment or townhouse. Meanwhile, Generation X members and baby boomers show a strong preference for the suburbs; 55 percent of them told researchers they have no problem with a longer commute and driving to amenities as long as they can live in a single-family, detached house. Learn how members are transforming town centers with creative reuse, smart growth initiatives, and project funds from NAR. Women tend to prioritize walkability and public transit more than men, according to the survey. Fifty-four percent of women surveyed said that sidewalks and places to take walks are very important to them when deciding where to live. Thirty-nine percent also said having public transit nearby was important. Overall, 60 percent of the 3,000 adults surveyed live in a detached, single-family homes. But of those 60 percent, 21 percent said they would rather live in an attached home that offered greater walkability. Sixty percent of those surveyed also said they’d be willing to pay more to live within walking distance of parks, restaurants, and shops. Further, 80 percent of respondents said that sidewalks are a positive factor when purchasing a home. Choir Concert tonight at 6:15 p.m. at the Lincoln School in Hibbing. The Hibbing Salvation Army will host a Christmas dinner (feeding program) Friday December 22 from 4 p.m. to 5 p.m.
Mortgage rates were in a holding pattern this week, even after the Federal Reserve voted Wednesday to hike its benchmark interest rate. 30-year fixed-rate mortgages: averaged 3.93 percent, with an average 0.5 point, dropping from last week’s 3.94 percent average. Last year at this time, 30-year rates averaged 4.16 percent. 15-year fixed-rate mortgages: averaged 3.36 percent, with an average 0.5 point, the same as last week. A year ago, 15-year rates averaged 3.37 percent. 5-year hybrid adjustable rate mortgages: averaged 3.36 percent, with an average 0.3 point, rising from last week’s 3.35 percent average. A year ago, 5-year ARMs averaged 3.19 percent. Read more: Are Higher Home Prices Spooking Buyers? Researchers found that buyers are more drawn to a house priced “just below” at, say, $199,000 than to a house priced at a rounded number like $200,000. Indeed, researchers found that such a “just below” pricing strategy yields a selling price that is about 2.5 to 3 percent higher – or $5,000 to $6,000 more – on a $200,000 house compared with a rounded pricing listing strategy. Still, rounded priced homes usually have a shorter time on the market and a lower discount relative to listing price, researchers found. Yet, “sellers’ ability to set higher listing prices for properties using a ‘just below’ pricing strategy outweighs the lower discount and shorter time on the market associated with similar rounded priced strategy homes,” researchers found. This year, give back Send in a donation of $30 to buy food for one family in need this Christmas!